Preheat the oven to 350°. In a large bowl, toss the apples with 1 tablespoon of the flour, 3/4 cup of the granulated sugar, the dark brown sugar, lemon juice, cinnamon, vanilla and nutmeg. 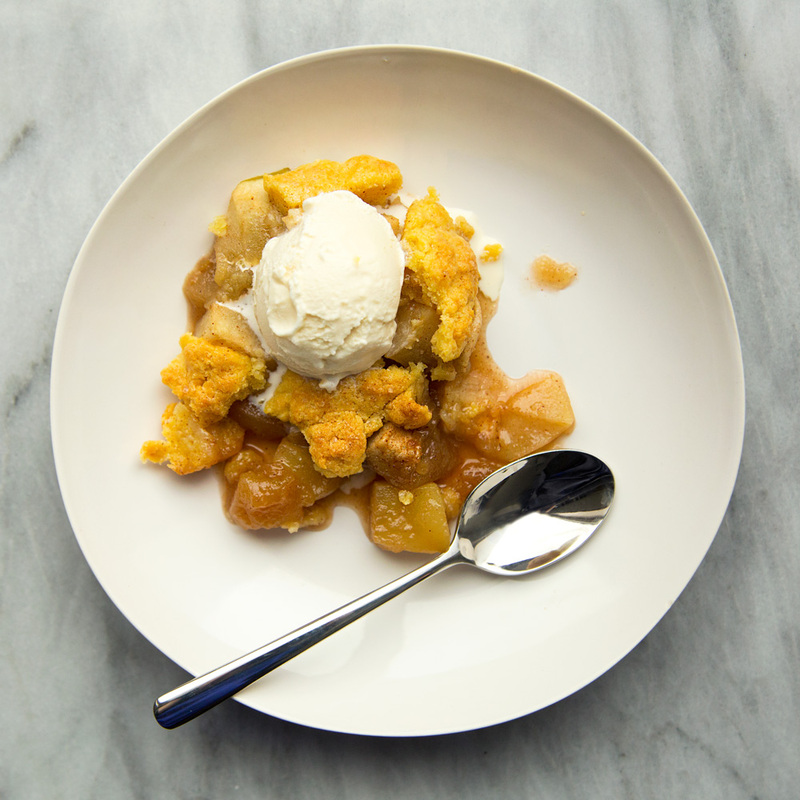 Scrape the apples into a 3-quart oval baking dish. In a food processor, pulse the remaining 3/4 cup of flour and 1 tablespoon of granulated sugar with the cornmeal, baking powder and salt until combined. Add the butter and pulse until pea-size pieces form, about 30 seconds. Add 3/4 cup of the heavy cream and pulse until moist crumbs form. Scrape the crumbs into a medium bowl, stir with a rubber spatula until evenly moistened, then sprinkle over the apples. Brush the topping with the remaining 2 tablespoons of cream and sprinkle with the turbinado sugar. Bake the cobbler for about 50 minutes, until the topping is golden brown and the filling is bubbling. Serve warm with vanilla ice cream. Review Body: Love the combination of warm and cold!